See http://www.shsu.edu/~chm_tgc/primers/pdf/XAS.pdf for a PDF version of this document. The major parts of this instrument are an X-ray source, a sample holder, an X-ray monochromator, and a detector. A common X-ray source generates X-rays by bombarding a heavy metal target with high energy electrons. The choice of heavy metal controls the range of energy of the emitted X-rays. For instance, a tungsten (W) target produces higher energy X-rays than a silver (Ag) target. Most of the energy that powers this bombarding process is lost as heat so the target electrode needs to be cooled. More modern sources are more efficient and other X-ray sources, like synchrotron beam line at Stanford, use completely different X-ray beam sources. The X-ray source's purpose is to supply X-ray radiation to the sample so that (in this description) either X-ray absorption or fluorescence experiments can be carried out. In X-ray absorbance, sample atoms absorb X-rays from the source and the wavelength of the absorbed X-ray (usually recorded as the X-rays' energy) and the intensity of that absorbance provide the identity of that absorbing atoms and the concentration, respectively. 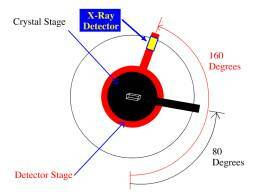 This X-ray absorbance causes ionization of the electron which absorbs that X-ray. The atomic orbital electrons absorbing this light are very close to the nucleus, say, in s orbitals. In X-ray fluorescence, absorbed X-rays cause the ejection of an atomic electron (not a bonding or lone-pair e-)--that is, atomic ionization--and that hole is immediately filled by an electron from an orbital further from the nucleus. To drop down to fill the hole, the outer electron must emit energy. This emitted light is X-ray fluorescence. So far what we've described is an absorbance or fluorescence experiment similar to, for instance, a simple ultraviolet absorbance or fluorescence experiment. But the monochromator in an X-ray instrument is somewhat different from a visible (400 to 700 nm) or UV (400 to 200 nm) wavelength grating or prism monochromator. Since the wavelengths of X-ray are so short (say, 0.1 to 1 nm), light dispersion using (prism) glass or metallic (grating) closely spaced groves isn't possible. Instead interaction with high purity crystals are required; these act like a grating. The crystals (different ones are required for different X-ray energy ranges and double crystals can be used) are placed on a moveable stage via which the angle at which the incoming X-rays strike the crystal can be continuously and smoothly varied. At the same time, the angle at which X-rays scattered (exit) from the crystal are detected is also varied, but at twice the angle of the incoming angle. In the image below the crystal stage has rotated through 80 degrees so at this instant the detector stage has rotated through 160 degrees. 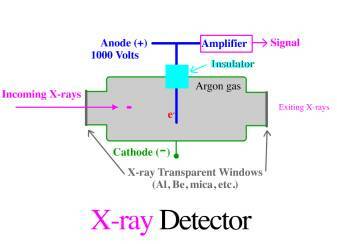 The detector described here creates an electronic signal (it's an X-ray photon transducer) by the collision of X-rays with a high purity argon (Ar) gas. The collision causes Ar ionization and the production of free electrons which flow to a positive electrode. The current flow between the electrodes in the detector is proportional to the incoming X-rays. Voilà, a signal. Below is an absorbance spectrum. 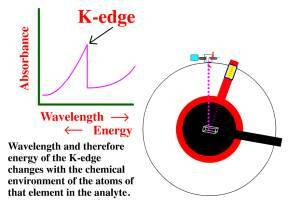 The shortest wavelength (highest energy) absorbance of elements analyzed by X-ray are called K-edges. Longer wavelength absorbances are L-edge, M-edge, etc. The shape of the absorbance edge is--when the feature is closely examined--very characteristic of the atoms involved in the absorbance. Very modern, K-edge X-ray spectra can be used to determine the oxidation state of heavy metal atoms and even whether the heavy metal atom is bonded to a carbon or a hydrogen, etc. In other words X-ray spectroscopy using spectral fitting from spectra taken using with available chemical standards can be used to determine the chemical environment of heavy metal atoms in complex samples. Environment here means atomic bonding environment.